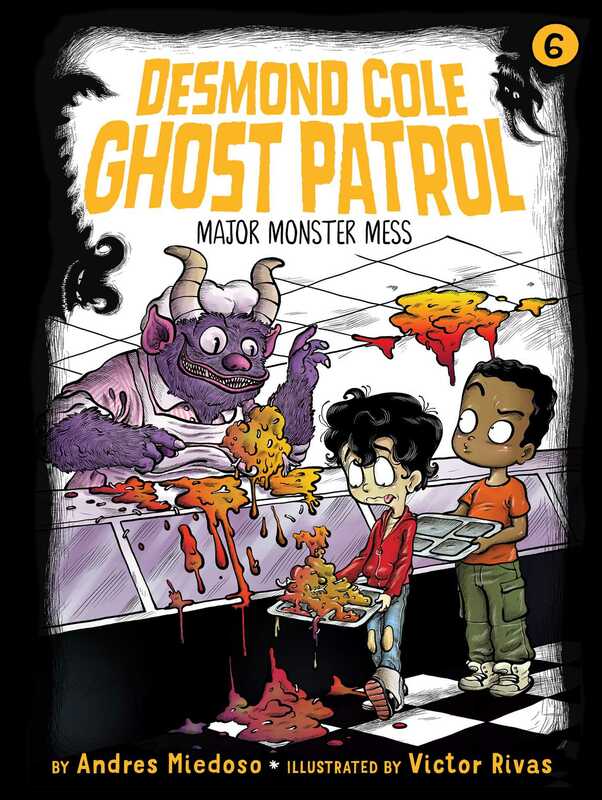 It’s Desmond and Andres versus creepy monster lunch ladies in the sixth book of the Desmond Cole Ghost Patrol series! Usually the cafeteria is where good food goes to meet its maker, but at Kersville Elementary, lunchtime is a little different. For starters, the food is delicious and they serve dessert every day! But there’s one important thing to remember—Monsters cook great food, but they have to eat, too! When it comes to school cafeterias, I’ve learned that they are always a mystery. Sometimes they are great! Sometimes they are the grossest places in the world. The problem is that you never know which one you’ll get until you eat there. See? That’s me . . . not eating the most horrible food ever. But that all changed when I moved to Kersville. The cafeteria here at Kersville Elementary is one of a kind. The food is excellent, according to my best friend, Desmond Cole. Whether it’s Macaroni-and-Cheese Monday or Fried-Chicken Friday, the food always makes him happy. So do the cafeteria workers. They must really like Desmond because they always give him extra food. They even make him special treats. One time they made a purple milkshake just for him. I don’t know what made it purple, and I didn’t ask! Desmond thinks the cafeteria is perfect. But my parents always say: If something seems too good to be true, it probably is. That’s what I thought about my new cafeteria: It seemed too good to be true. If only I knew how right I was!